Success with your medical school application depends on perseverance and timing. During senior year, you finished up secondary applications and give medical school interviews. You deal with multiple acceptances if you get them and waitlists if you’re put on one. If all goes well, you spend the summer after you graduate getting ready to head off to medical school. 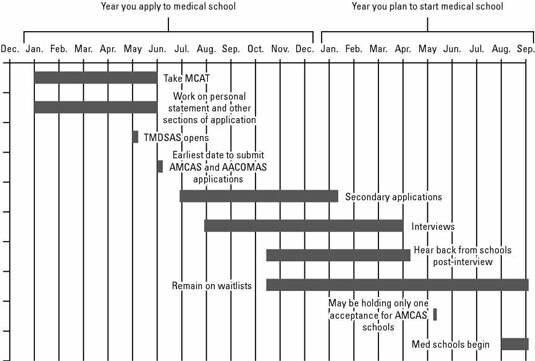 As you can see, the medical school application cycle is a long one that begins your junior year. Even so, assuming that you start early and stay on top of things, you should be sitting at the end of the cycle with an acceptance to a medical school. This month, you head deeper into interview season, although you may still also be filling out the last few secondaries that trickle in. Interviews are underway at most medical schools. Complete remaining secondary applications. A few schools that screen applications prior to sending a secondary may send secondaries later in the cycle, but an early applicant will have received the vast majority of secondaries by September. Continue with clinical, volunteering, research, and leadership experiences during senior year. Mid-October is when some schools that use the AMCAS application send out their first batch of acceptances, so you may hear some good news then. AMCAS schools notify EDP applicants of decisions by October 1. Earliest acceptances for regular (non-EDP) AMCAS applicants are offered on October 15. Other schools begin offering acceptances later in the fall or winter. TMDSAS schools begin offering acceptances to nonresident, dual-degree, and other special program applicants. Interviews continue in full swing through the fall and partway into the winter. TMDSAS schools start extending offers to in-state applications during this period as well. TMDSAS schools begin extending offers of acceptance to Texas residents in mid-November. Interviews continue through late January or February at most schools, and as late as March or April at others. Interview season comes to an end by spring, but the admissions process isn’t over yet. Schools are still making decisions about applicants they’ve interviewed. If you find out that you’ve been waitlisted, keep up contact with the school. Schools continue to send out notifications of acceptance, rejection, or placement on waitlists. Update schools you’ve been waitlisted at with new activities and achievements. The exact timing of updates depends on when you were waitlisted and when you have new information to provide the schools. For AMCAS applicants, mid-May marks the time when they must whittle the number of seats they’re holding down to one. As a result, this month can bring good news for those on the waitlist as spaces open up that need to be filled. Decide which school you will continue to hold your place at if you’ve been accepted to more than one school. Applicants may hold acceptances at multiple AMCAS schools until May 15. By May 15, applicants have to choose from the schools they’ve been accepted to, although they may remain on waitlists for other schools. You’re not committed to the school you accept though; if you get brought up off a waitlist at a school higher on your list, you can withdraw from the spot you’re holding. Waitlists begin to move primarily after May 15, when applicants holding multiple acceptances relinquish their extra places. Now that you’re free from your premedical studies, focus on getting ready for medical school. But don’t make the summer all about work; take some time to enjoy yourself before you embark on your first year of med school. Remain on waitlists for schools you continue to be interested in and update those schools and/or send a letter of interest. Prepare to start medical school, including relocating if necessary. Do something fun before starting med school!